Civil War Union Letter U.S. Signal Corps, 12th IL Inf. 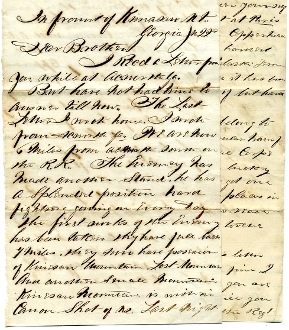 Autograph Letter Signed (ALS), 4pp., 8 vo., In front of Kennesaw Mountain,Ga. 6/22 (64). Soldier John Boatman (Co. E, 12th Illinois Infantry, Capt. Howard's & McClintock's Co. U.S. Signal Corps Vol.) writes his brother about fighting at Kennesaw Mountain. "...we can see the Rebs on the MT with an naked eyes. I was looking at them a moment ago through the Telescope" etc. Great content letter. For full transcription. please see scan. Boatman enlisted into the service on Augusr 1,1861. He was detached to the Signal Corps on March 1, 1864 and transferred to the Signal Corps on June 30, 1864 near Kennesaw Mountain. On August 22,1865 Boatman was discharged from the Department of Tennessee. He saw action against Forts Henry and Donelson, Shiloh, Seige of Corinth. While with the Signal Corps he participated in Sherman's Atlanta Campaign, Savannah Campaign and the Carolinas Campaign.